Об игре: Soccer meets driving once again in the long-awaited, physics-based sequel to the beloved arena classic, Supersonic Acrobatic Rocket-Powered Battle-Cars! A futuristic Sports-Action game, Rocket League, equips players with booster-rigged vehicles that can be crashed into balls for incredible goals or epic saves across multiple, highly-detailed arenas. Using an advanced physics system to simulate realistic interactions, Rocket League relies on mass and momentum to give players a complete sense of intuitive control in this unbelievable, high-octane re-imagining of association football. Awesome features include: All-new Season Mode that allows players to enjoy a full single-player experience. Extensive Battle-Car customizations with more than 10 billion possible combinations. Unlockable items and vehicles, stat tracking, leaderboards, and more. Addictive 8-player online action with a variety of different team sizes and configurations. Amazing 2-, 3-, and 4-player splitscreen mode that can be played locally or taken online against other splitscreen players. Broadcast-quality replays that allow you to fast forward, rewind, or view the action from anywhere in the arena. Competitive cross-platform gameplay with PlayStation®4 users. 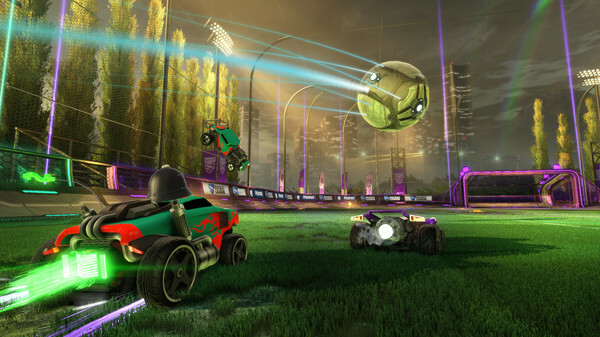 NOTE: Because of agreements with our online service provider, there are certain regions that are unable to connect to Rocket League’s online multiplayer component. As a result, server access is restricted in China, Crimea, Cuba, Iran, North Korea, Sudan, and Syria. Apologies to our customers in those regions. Все спасибо! Все работает! Все отлично!